Having been around since 2004, Casino.com has a great deal of experience in pleasing online gambling customers. 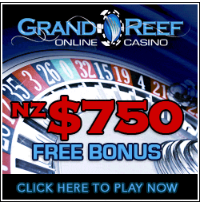 Aimed at players from New Zealand, the online casino operator knows exactly what Kiwis are looking for in a quality online gaming experience, so you’ll find some of the best online casino games and most generous promotions available on the web. The first thing that you’ll notice when you sign up to play at Casino.com is its wide selection of bonuses and promotions. All players are welcomed with a 100% match bonus up to $200 – but it doesn’t stop there. Players are also eligible for a 25% reload bonus, meaning that they can earn bonus cash every week, regardless of any other promotions happening at Casino.com. The online casino also offers players unique bonuses and promotions every month. They change on a regular basis, so be sure to check out the casino’s promotions page every month to find out how you can earn bonus cash! There is a vast variety of games available at Casino.com, including table games, slots and card games. You’ll find the same selection of games at Casino.com as you would at any land-based casino. While this means that you might not find certain variations of titles, you can rest assured that the casino only offers the highest quality games. You’ll find common table games like Blackjack, Roulette and Craps, in addition to a wide range of slots. 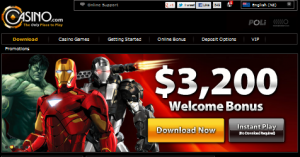 Some of the most popular slots games that Casino.com has to offer are: X-Men, Rocky and Iron Man 2. There are plenty of deposit option available at Casino.com, perfect for an online gambler. You can use e-wallets like NeTeller and prepaid cards like uKash. Bank transfers and credit card deposits are also available. All 12 options also offer players instant deposits for more convenient gameplay. Should you encounter any trouble while playing at Casino.com, you can contact customer support via telephone, email and live chat. Casino.com is also one of the few online casino operators to use Twitter and Facebook to interact with players. Since many internet users log in to Facebook more often than their email, this is certainly a convenient option.